This entry was posted in Environmentalism, Science. Bookmark the permalink. How coincidental! Long Beach in California? I live only a short way away from there–and my mother is currently looking for/has found ghostwriters for her screen-plays recently. :3 Wouldn’t it be funny if we found out you were working for her? Apparently I lack picture reading comprehension because when I first saw that picture, I thought both were looking at some kind of electronic device and that they were actually communicating with each other and learning about each other rather than contrasting tech with nature. 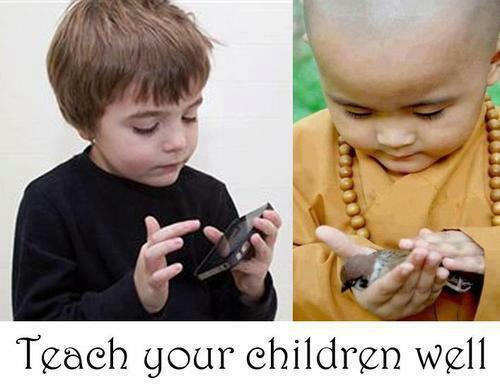 I did not actually notice that was a bird in the second child’s hands. Even with the description. I’m with you there on that one. Although I find this line curious, “that also leave plenty of room for all of our nonhuman neighbors on the planet.” It implies that we live separately from other species, why not come at it with mutualism/co-operation, where most every species can co-exist along side one another? I saw the image differently, though I feel it plays into the same overall theme you describe. “Teach your children well”, both children are handling the items in their hands with respect. They’re not taking the iphone or the bird for granted, tossing them aside when they’re no longer convenient. They’re appreciating them instead. I like your interpretation, thank you!